In full disclosure I am not a big sugar fan – except for my daily addiction to dark chocolate! Never have liked soft drinks. Also hesitant to get involved in any controversy over “toxic refined white sugar” and “high fructose corn syrup”. However you have to admire honey bees as a key component in world agriculture pollination regardless of your thoughts on honey. 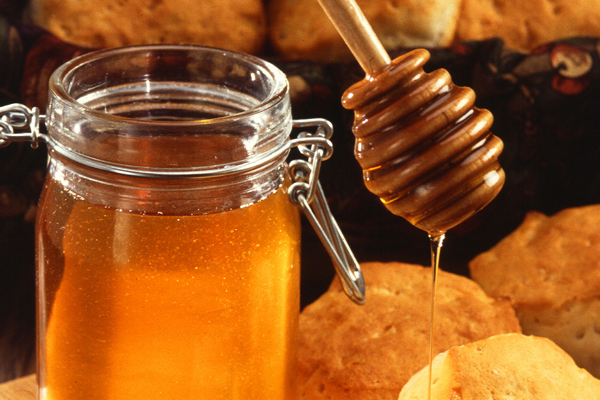 Still there is increasing popularity for the use of honey as a natural sweetener. There are many types to discover from light mild to dark strong with unique flavours influenced by the local flowers – clover, buckwheat, alfalfa… I have fond memories of the old days trying to locate some tupelo honey after admiring Irish singer Van Morrison’s song of the same name – “she’s as sweet as tupelo honey”. Some comparisons could possibly be made to wine with the different complex “terroir” contributing to both products. Less processed raw honey is in increasing demand as is unpasteurized and unfiltered – rather than simpler commercial ones. The National Honey Board in the USA has volleyball star Kerri Walsh Jennings promoting honey for an energy boost during physical activity. We all have used lemon and honey in a hot drink to soothe a sore throat. Recently watched Dr. Oz on his TV show endorsing honey supported by 4 key points: immune boosting antioxidant (may even help with allergies over long term use but not yet scientifically substantiated); cough suppressant; heals wounds (especially New Zealand native manuka bush honey); and may help your blood sugar & high cholesterol. Regardless of all these health claims I still find I am using honey more (and sugar less) – especially at breakfast trying out different exotic interesting honey in my no fat Greek yogurt! My wife Joan really enjoys from the Okanagan wine region in British Columbia her pure unpasteurized wildbrush/wildflowers creamed honey on her morning toast. What about you? Lots of choices out there so what is your favourite go to honey? What is your favorite go-to honey? I recall from my childhood the sourwood honey found along the Blue Ridge Parkway in the mountains of North Carolina. We would mix the honey with comb and butter to make a spread for our toast. Sadly the decline of the sourwood trees make true sourwood honey very hard to find any more.